We want you to enjoy your vacation on Anna Maria Island. 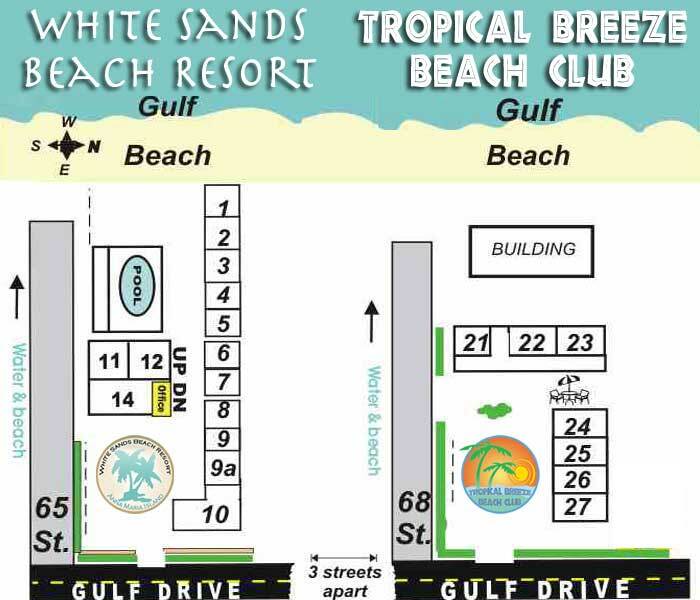 Here are our White Sands Beach Resort and Tropical Breeze Beach Club resort policies concerning deposit requirements, check in, guest and cancellation policies. Please review and contact us at (941) 778-2577 with any questions. Deposit Should be equal to ( 50% of room price), 2 nights stay or $300 dollars per week the Greater of the three. Cash / Check Discount available $5 a night from standard rate if the entire stay is paid by check or cash when you arrive Monthly reservations require $300 dollar deposit When making reservation and a 50% rental payment 90 days prior to occupancy. ALL ROOMS ARE NOW Non-Smoking. Smoking is allow outside. There will be a $450 charge and removal for smoking, pets or parties in rooms Please let us know if you are a smoker so we can make other arrangements for you or you can smoke outside if you would like to rent these rooms. The time factor is critical in vacation rentals, and your reservation will hold this rental off the market for a period of time. Deposit will be refunded with a 55 day advanced written notice by U.S. Mail Only, Less a $55.00 service charge and There is an additional cancellation fee of 5% of Deposit, if a credit card was used. Any changes in arrival or departure dates less than the 55 day notice, resulting in loss of revenue may forfeit your deposit!! Rental payments are non-refundable unless the entire rental period is re-booked. Balance due upon arrival. Because of the size of our facilities & in order to keep are facilities nice and quiet, Pool and Premises are for paying guests only. Basic Prices on 1 bedrooms are priced for 2 persons. Basic Price on 2 bedrooms are priced for 4 persons. There is an Extra Guest Charge of $10.00 per day/per person for visiting guest (not to exceed maximum room occupancy). Arrangement for visitors must be made before they arrive. There is a $20 dollar per guest charge for guest that have not be preapproved. There is an understood Damage/Security deposit for any careless damage to room & premises during stay & may be applied on. Sorry NO PARTIES & NO PETS! (PET & or PARTY CHARGE $450 per room and immediate removal ). Due to the size, location and style of atmosphere we have try to create for our Guests. Here is a list of Basic conduct, behavior and courtesy we expect all our guests to maintain at all times. We do this to insure the everyone has a good time, and everyone's children are not exposed to inappropriate behavior. If our looking for a "spring break party place" or trying to relive your drunk college days, please look for some place else. There are plenty of places that do cater to this, we are not one of them. Try Clearwater, Daytona, Key West or New Orleans for this type of Fun and have a great time. f you choose to stay with us, We hope you have a great family style wholesome vacation were you meet wonderful people and make friends and memories that will last a lifetime. • The Resort is a family-oriented establishment. • Please be courteous and respectful of the other guests during your stay at the Resort. Our resort is a family oriented, Family friendly resort all language and behavior should be kept to a “E” “Everyone”Rating only. • The Resort may remove from the premises any guest or other individual who, while on the Resort premises; is intoxicated; engages in illegal or disorderly conduct; engages in profane, lewd, drunken, ”spring break/frat party type Behavior” or brawling behavior; engages in any language or conduct that disturbs the peace and comfort of the other guests at the Resort or which injures the reputation, dignity, or standing of the Resort; fails to make a required payment; fails to check out at the required time; or, in the opinion of the Resort, is a person the continued entertainment of whom would be detrimental to the Resort. • Parties and drinking games are prohibited. • Any radio or stereo system must be used with headphones or ear pieces. • All outdoor activity after 10:00 pm EST must be conducted at a whisper. • Outdoor activity is prohibited after 11:00 pm EST. • When using the swimming pool, guests must obey all swimming pool rules. The swimming pool closes at dusk. • Guests must not block sidewalks or any other common areas with their personal property. • NO Profanity, also known as swearing, cursing, foul speech, and cussing, is a show of disrespect, a desecration or debasement of someone or something, or just the act of expressing intense emotions. Profanity can take the form of words, expressions, gestures, or other social behaviors that are socially constructed or interpreted as insulting, rude, vulgar, obscene, obnoxious, foul, desecrating or other forms. Rooms left Moderately clean there is no charge for cleaning, However Cleaning charge for messy rooms & Late checkouts $40 + 15 hr minimum. 1 car parking per room. We Guarantee room type, not room number! Please check above information carefully. If you have any questions you may call us at (941) 778-2577 or fax us at (941) 778-5897. Please let us know if you are a smoker. Management reserves the right to remove guest from premises. Please reconfirm your reservation 30 days before arrival. Looking forward to seeing you soon!